The methods of measuring skulls for the purpose of determining certain topographical relations, the most important measurement of the skull being the cranial index, or the cephalic index in case the measurements are taken on the living. This consists in the ratio of the width of the head above the ears to the length of the head from the forehead to the most distant point at the back of the head. The cephalic index is expressed by multiplying the width of the head by 100 and dividing the product by the length. Thus, supposing a head to be 153 mm. wide and 186 mm. long, then 153 × 100/186 = 82.26, the cephalic index. The broader or rounder a head is, the higher is its cephalic index, and vice versa. When the cephalic index is above 80 anthropologists term it "brachycephalic"; between 75 and 80, "mesocephalic"; and less than 75, "dolichocephalic." Crimea (Karaites) 30 83.3 "
The 30 Crimean skulls measured by Ikoff, being those of Karaites, can not, perhaps, be considered Jewish in the strict sense of the word; and no conclusion can be drawn from the remaining 70. On an examination of the figures in this table a remarkable uniformity of the cephalic index of the modern Jews will be noticed. Excepting the Caucasian Jews, of whom but few have been measured, it is shown that nearly 90 per cent are between 81.5 and 83. This indicates a limited variability and differentiation. In fact, the differences are so slight (from 80 to 83) that they may be fairly assigned to the usual discrepancies between different series of measurements of a single and homogeneous race. Another remarkable fact is the striking absence of the dolichocephalic type, which is characteristic of all the other modern Semitic races and tribes, as the Arabs, Syrians, Abyssinians, etc. Among the modern Jews this ranges, as is seen in the table, from 1 per cent, in Blechman's series, to 7.3 per cent in Glück's. On the other hand, the brachycephalic type predominates, nearly all the series showing more than 60 per cent of heads having a cephalic index of over 80. 139 Russian Jews, measurements made by Yakowenko. 100 " " " " Blechman. 100 " " " " Weissenberg. 67 " " " " Stieda. 112 Italian " " " Lombroso. 53 Caucasian " " " Pantukhof. 500 Jews from various countries measured by Fishberg. These 1,071 heads are classified as follows: dolichocephalic, 17 = 1.58 per cent; mesocephalic, 235 = 21.94 per cent; brachycephalic, 819 = 76.48 per cent. What is most worthy of notice is the small percentage of dolichocephaly—only 1.58 per cent—and the large preponderance of brachycephaly, 76.48 per cent. The graphic representation of these 1,071 measurements is shown on the accompanying diagram. The cephalic index is marked from left to right, the percentage of persons having a given index being indicated above each index. Thus, 10.46 per cent of heads have an index of 80; 14.19 per cent, one of 82; and so on. The curve culminates at the index of 82—corresponding exactly to the average and also to the mean index. The largest percentage of people have this cephalic index; and around them are clustered the majority of heads—those having larger indexes to the right, and those with smaller indexes to the left. At the index of 75 the line of the curve begins to ascend regularly and rapidly, until it reaches 82, when it rapidly descends. It thus forms an acute pyramid with its apex almost in the middle. "A sharp pyramid generally denotes a homogeneous people: if they were all precisely alike, a single vertical line, 100 per cent, would result" (Ripley). 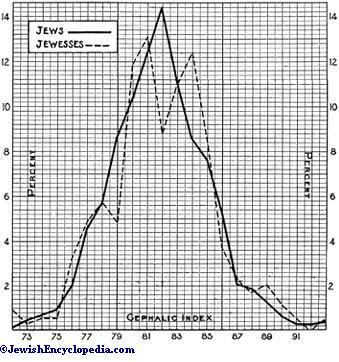 Cephalic Index of 1,071 Jews and 345 Jewesses. The index is indicated along the base-line. The percentage of a given index is indicated by the altitude. The cephalic indexes from which this curve was obtained were those of Jews in various parts of the world. Russian Jews are those observed by Yakowenko, Blechman, Weissenberg, etc. ; Italian Jews (Sephardim), by Lombroso; Causasian Jews, by Pantukhof; while those measured by Fishberg include Russian, Polish, Austrian, Hungarian, Rumanian, German, and American Jews. Some, though very few, in the last-mentioned series are of African origin. When figures taken from such diverse elements of Judaism present such a homogeneity, it can safely be concluded that the cranial type of the modern Jews shows very little if any intermixture of foreign blood. So little has this been anticipated that Lombroso, in his frequently quoted comparison of 95 Italian and 112 Jewish heads, insists upon the variability of the latter;whereas, if he had drawn a curve, the result would have shown several apexes among the Italians and only one, and that a steep one, for the Jews at the usual index (82—), leading to an exactly opposite conclusion to that of Lombroso. In the measurements of 345 heads of Jewish women collected by Fishberg (50 from Weissenberg's measurements, 80 from Yakowenko's, and 215 from Fishberg's), the following distribution is found: dolichocephalic, 9 = 2.61 per cent; mesocephalic, 67 = 19.42 per cent; brachycephalic, 269 = 77.97 per cent. These figures agree with those cited above for men. A curve drawn from the measurements of 345 heads of Jewesses here recorded has the appearance indicated in the accompanying diagram. It will be observed that this curve is not a smooth pyramid, as is the curve of the cephalic index of Jews. It shows, in fact, a decided double apex. one pointing at an index of 81, the other at 84, which seems to indicate a greater variability and differentiation in Jewish females than in Jewish males. This is contrary to what has been observed throughout the organic world. This point, recently brought out by Fishberg ("American Anthropologist," Oct.-Dec. 1902), is of sufficient scientific interest to merit further investigation. The absolute figures obtained by craniometry of modern European Jews show a striking uniformity unknown among other civilized races. In the accompanying table the length of the head varies from 183 mm. in Majer's and Kopernicki's, Weissenberg's, and Yakowenko's series, to 188 mm. in Blechman's—a difference of only 5 mm., which is comparatively insignificant. The same is the case with the width of the head, which varies from 150 to 156 mm.—a difference of only 6 mm. As is the universal rule, the circumference of the head of the male is greater than that of the female by about 2.5 cm. (1 inch). Another point worth noting is that (wherever data are obtainable) the circumference of the head among the Jews is, as a rule, greater than that among the races with whom they dwell. The most important problem suggested by a study of craniometrical results concerning Jews is the relation of the type head of the modern Jews to that of the ancient Hebrews and to the modern Semitic skulls. The pure Semitic skull is dolichocephalic, as may be seen from a study of the heads of modern Arabs, Abyssinians, Syrians, etc. The cephalic index of these races is from 73 to 77. As is at present accepted by nearly all anthropologists, the shape of the head is the most stable characteristic of a given race. It is little if at all influenced by climate, environment, nutrition, or sexual and social selection. The only way the type of the head may change is by intermixture with other races. If the ancient Hebrews were of the same stock as the modern non-Jewish Semites, and if the modern Jews are their descendants, then a pure dolichocephalic type of head would be expected among the Jews. As has been seen, all the results of craniometry prove that the Jews are brachycephalic, and that the dolichocephalic form is only found among them in less than two per cent of cases. This can be explained in two ways: either the modern Jews have very little Semitic blood in their veins, as Lombroso, Luschan, and others are inclined to think, or the ancient Hebrews may have been a brachycephalic race. In order to establish this, an examination is necessary of more skulls of ancient Hebrews, which are not available at present. The only skulls of ancient Hebrews recorded are five obtained by Lombroso from the catacomb of St. Calixtus in Rome, dating back to 150 C.E. Lombroso aptly remarks that these skulls are of great importance, because at the period from which they are derived (second century), there could not have been any considerable racial intermixture of the Jews with other peoples, and the cranial typethey represent should be considered pure. The cranial indexes of these skulls are 80, 76.1, 78, 83.4, and 75.1, giving an average cephalic index for the living of 80.5, which is far above the cephalic index of the non-Jewish Semites. Of course, no positive conclusion can be drawn from only five skulls; still, the fact that among these are found two brachycephalic and only one dolichocephalic, points strongly against the opinion that the ancient Hebrews were a purely dolichocephalic race. The twelve skulls from a Jewish cemetery in Basel, of the thirteenth and fourteenth centuries, which have been examined by Kollmann, are even more brachycephalic than those of contemporary Jews. The average cranial index of these skulls is 84.66; i.e., a cephalic index of 86.66. This again shows that the brachycephalism of the modern Jews is not of recent origin. It can therefore be stated that the modern European Jews are shown by craniometrical evidence to be a pure type, and that no evidence of appreciable racial intermixture is discoverable. 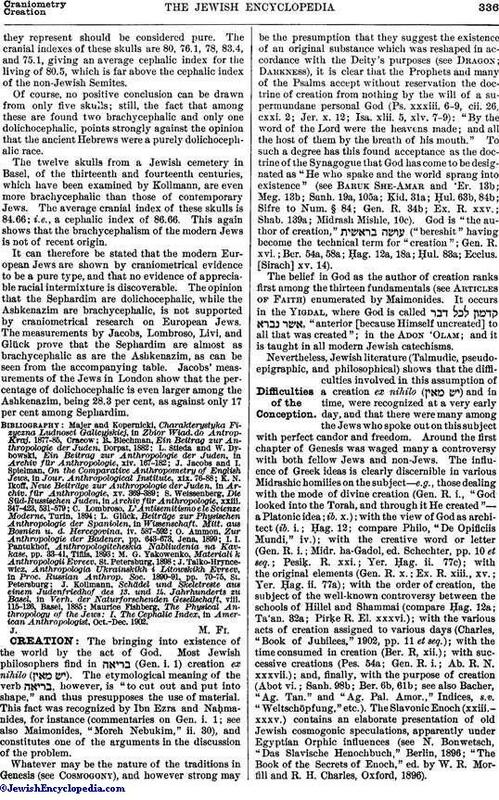 The opinion that the Sephardim are dolichocephalic, while the Ashkenazim are brachycephalic, is not supported by craniometrical research on European Jews. 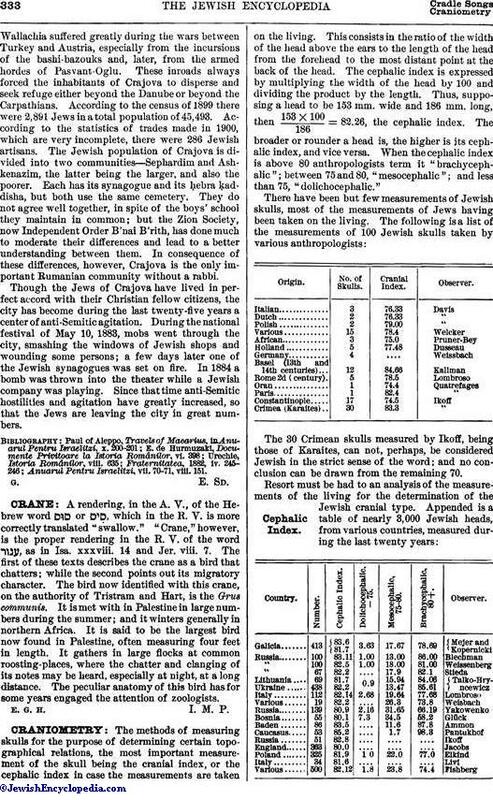 The measurements by Jacobs, Lombroso, Livi, and Glück prove that the Sephardim are almost as brachycephalic as are the Ashkenazim, as can be seen from the accompanying table. 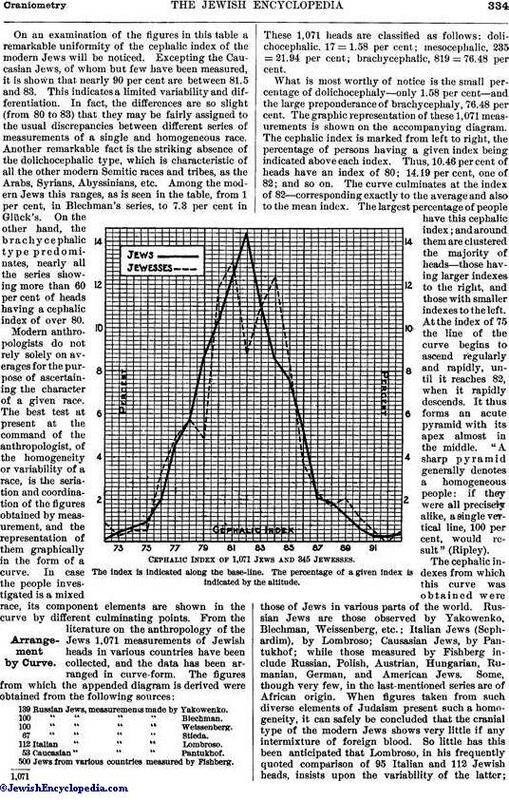 Jacobs' measurements of the Jews in London show that the percentage of dolichocephalic is even larger among the Ashkenazim, being 28.3 per cent, as against only 17 per cent among Sephardim. J. Kollmann, Schädel und Skeletreste aus einem Judenfriedhof des 13. und 14. 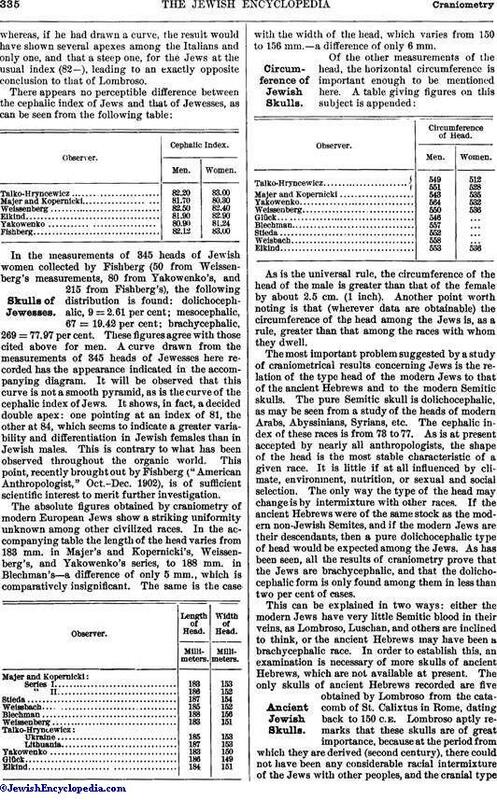 Maurice Fishberg, The Physical Anthropology of the Jews: I, The Cephalic Index, in American Anthropologist, Oct.-Dec. 1902.